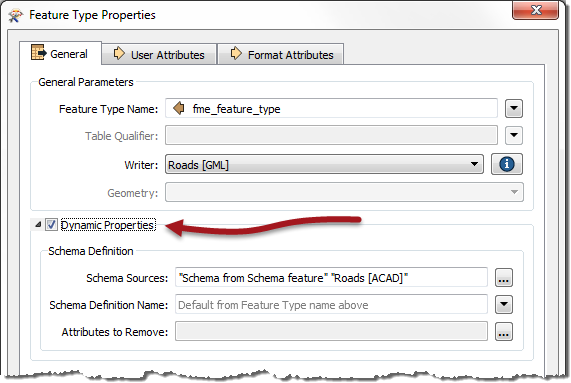 As per the hierarchy diagram, each Writer in FME can have a number of feature types. 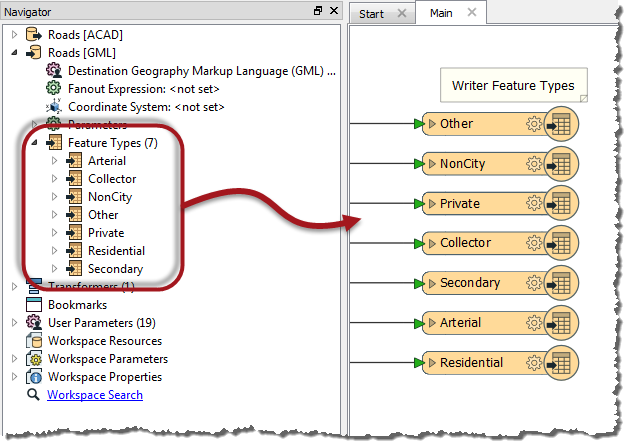 Feature types define the layers being written to a destination dataset and the attributes for those layers to possess. They are represented as objects on the workspace canvas and also listed in the Navigator window. A workspace can contain any number of Writers, each with any number of feature types. The attributes on a Reader feature type represent &apos;what we have&apos; - literally what already exists in a source dataset. On the Writer feature type attributes represent &apos;what we want&apos;. These options are Automatic, Manual, or Dynamic. Being aware of what these options do is important for managing Writer feature types. So we’ll look into them with Manual definitions first, since they are the easiest to understand. In this example, we are starting to define an address table. We have entered the definitions for two attributes, and are just entering a definition for the third. By default, when you create a new workspace the Writer feature types are set in Manual attribute mode. An automatic attribute definition is when Workbench itself automatically defines the list of attributes, depending upon what Reader feature types are connected. Notice that all of the attributes defined - either on a Reader feature type or a transformer - are now copied over to the Writer feature type automatically. This is really useful because it means that multiple streams of data can be merged into a single feature type, and all attribute definitions are taken care of. However, what this won’t do is handle the scenario where you change a source dataset parameter to read a dataset with a different set of attributes. In other words, the Writer attributes will only be defined by what is connected, not what actually exists in the source data. For that scenario you need dynamic attributes. A dynamic feature type truly has no definition in advance. Instead, it dynamically takes its attribute definitions from either whatever data is fed to it when the workspace is run, or another set of schema definitions selected by the user. So, like an automatic definition, you don’t see attributes on the initial feature type. However, neither do you see attributes when Reader feature types are connected! OK let me spell out these important differences. Automatic attributes takes their definition from whatever is connected to them. If the Source Dataset parameter is changed, it will have no effect. Dynamic attributes are different. If the Source Dataset parameter is changed, the attribute definition comes from whatever source data gets read.